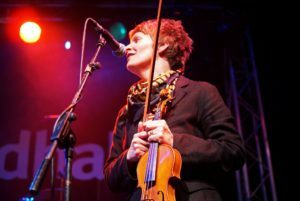 Kathryn Wheeler (vocals, accordion, fiddle) used to just play Early Music but now stays up late. 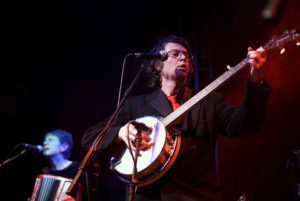 Jon Hoyle (vocals, guitar, ukulele, banjo, biscuit tin) plays a slide guitar with a blues band and used to do backing vocals until the women stole his microphone. Way Out West is their way of saying sorry. 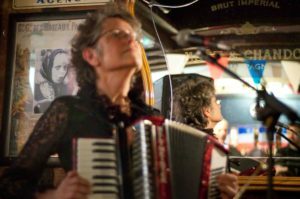 Pat Roberts (vocals, accordion, triangle, shaky pear) used to play with ceilidh and klezmer bands until she sold her soul to rock and roll and spent the proceeds on two bottles of cider.